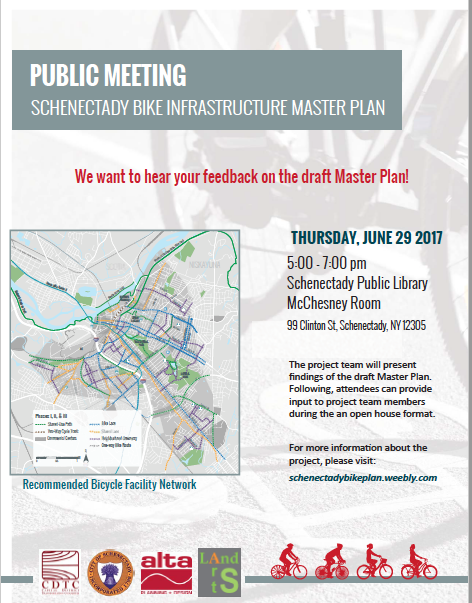 right: Google Map of the Park and vicinity . .
. . update (June 28, 2017): On June 29, 2017, the City of Schenectady will unveil and explain Bike Schenectady (Draft), the Schenectady Bike Infrastructure Plan. (Click image to the left for Public Meeting flyer). See our posting “The City’s Bike Plan: a Crucial Battle for Riverside Park” (June 28, 2017), for specifics relating to the Bike Plan and Riverside Park, a Slideshow with four dozen photos of users and usage of the Park Path, and additional commentary and sources. 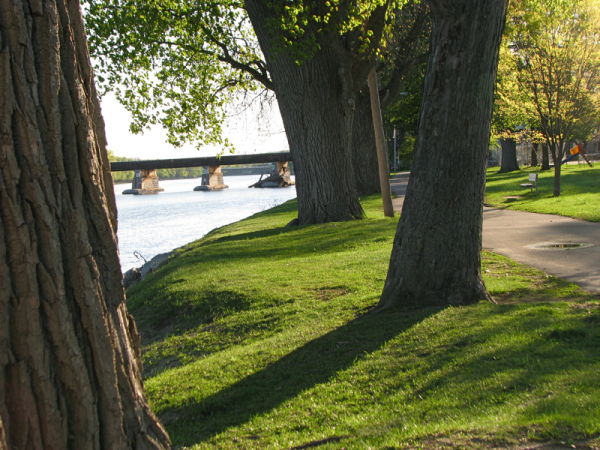 Schenectady’s Riverside Park is only 6 acres in size, stretching about a one-third of a mile along the Mohawk Riverbank; in many places it is only 150 – 200 feet wide. 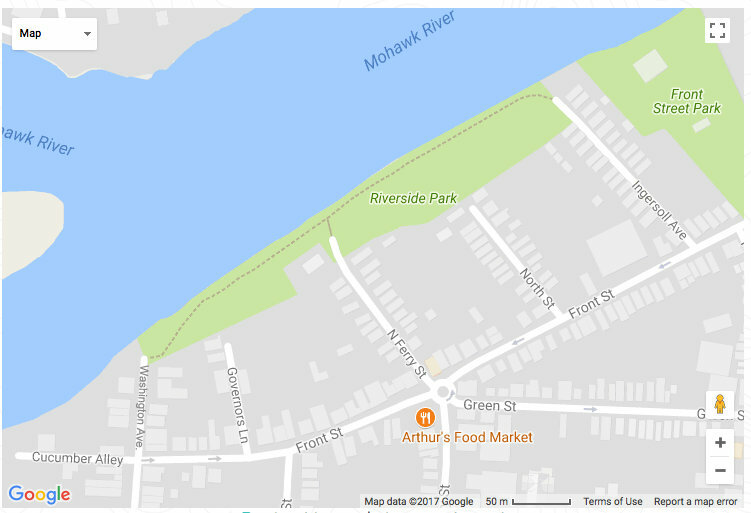 [click for TopoMap] Riverside Park’s only path is much more than a thoroughfare from point A to B. It has for decades been used by people of all ages and abilities for many leisurely pedestrian, passive-park and public-square purposes that are especially convenient on its paved surface. 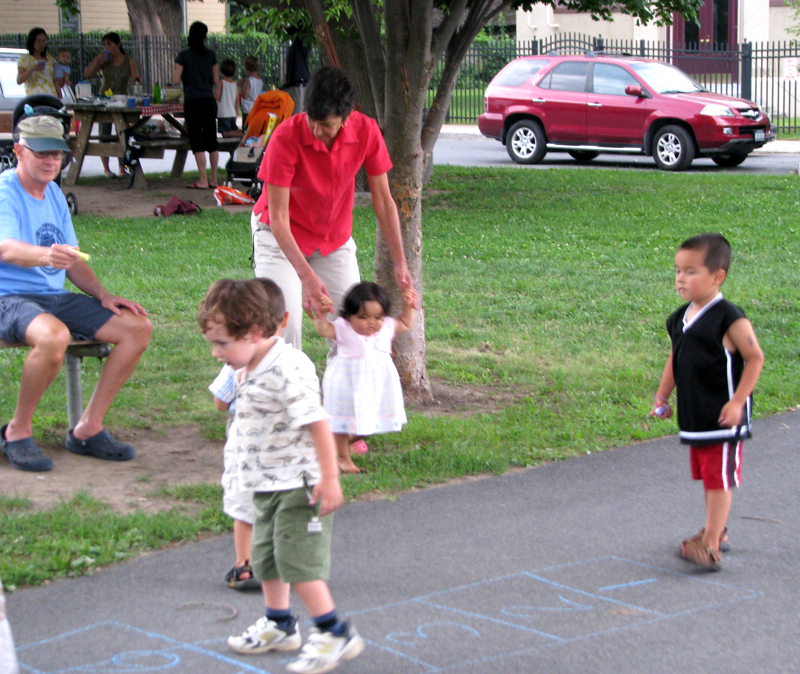 For example, many neighbors take advantage of the path for dog-walking (often more than one at a time), scenic exercise, romantic and platonic strolling with a friend, stopping to admire babies and puppies, catching up on family and neighborhood news, teaching a tyke how to ride a tricycle, complaining about City Hall, and watching sunsets and watercraft on the River. Moreover, it was traditionally a narrow footpath, having been widened significantly to its 10-foot width to keep large City vehicles and police cruisers from tearing up the ground on either side of the path. 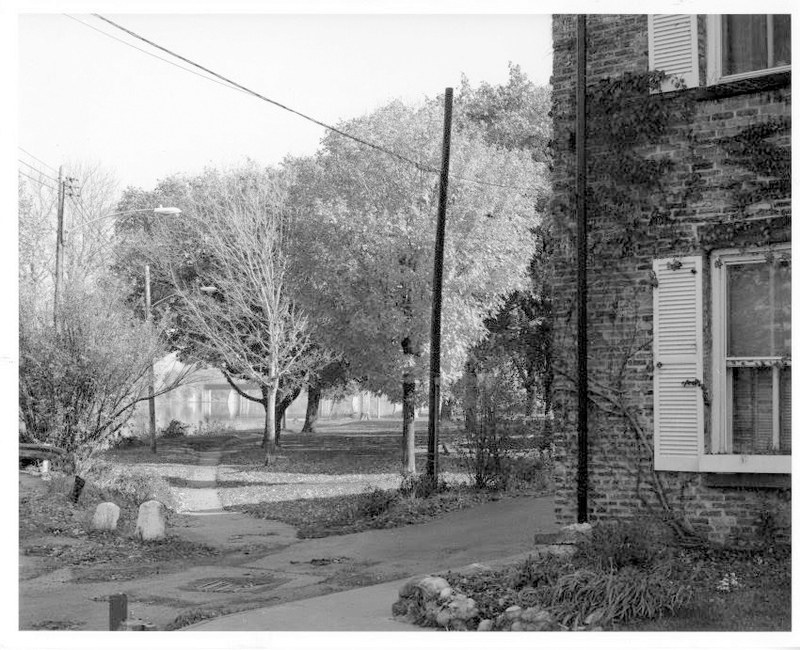 The path is bordered by benches, many large trees, an unfenced children’s play-lot at the east end, a Pump Station & Esplanade at its center, and small gardens with flowers and ornamental grasses on its especially narrow west end. 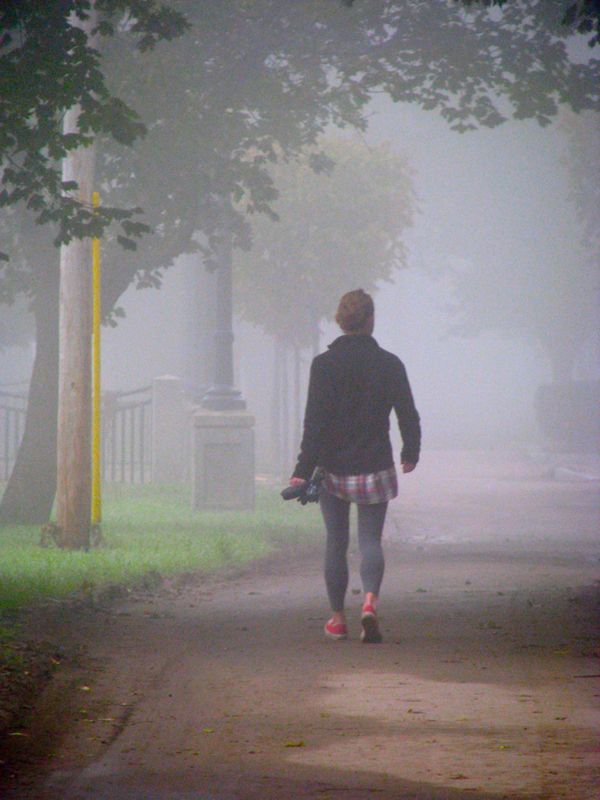 Visibility along the path can be hampered by thick morning fog off the Mohawk River, and its pavement is spotted with many wide and deep puddles long after any significant rainfall. In the River’s floodplain, the path is inundated with river water several times a decade (or more). 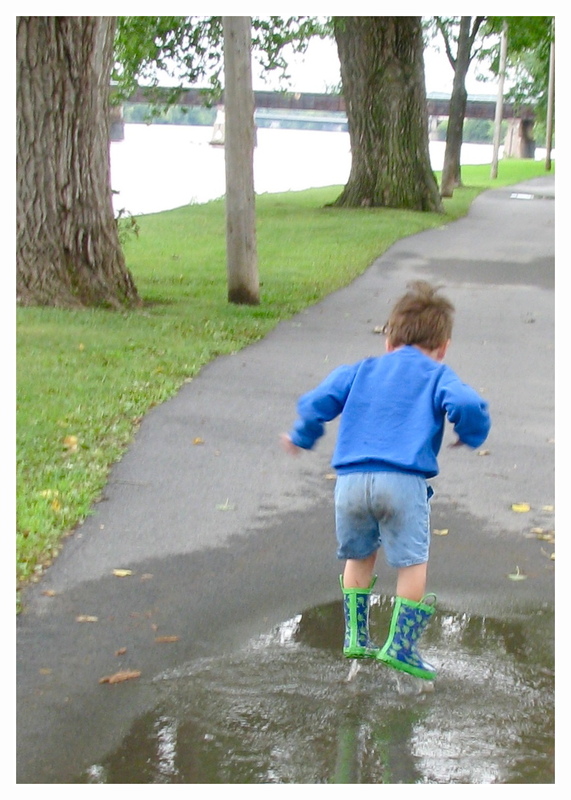 There is no other pavement in Riverside Park offering firm support for those using a walker, stroller, or wheelchair, for Hopscotch & Puddle-Jumping, or many other small, everyday joys that happen on our long, narrow, tranquil “public square” along the Mohawk. Insight from Victoria Walks. For a thoughtful discussion and recommendations on shared-path appropriateness and safety, based on significant experience and research, please read the 4-page position paper “Shared paths – finding solutions” (2015), by Victoria Walks, an advocacy group in the Australian State of Victoria (Melbourne is the main metro area). 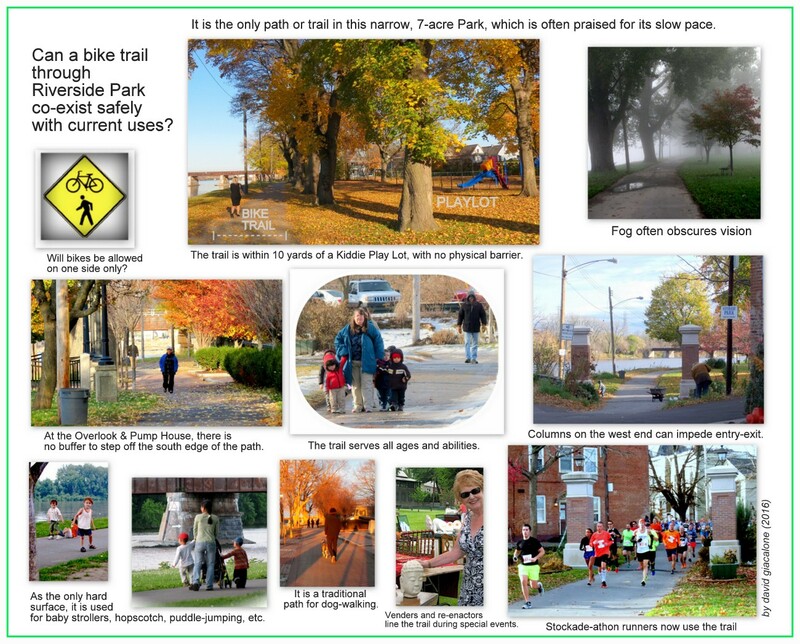 For the detailed, 40-pp research paper, see Shared paths – the issues. A main point of the group: “Victoria Walks has significant reservations regarding shared paths and how they impact walking, particularly by more vulnerable walkers. Generally, slow moving recreational cyclists may be able to share paths with walkers. However, walkers do not generally mix well with commuter or sports cyclists, who typically travel at higher speed.” Victoria Walks also recommends that “Road managers should avoid converting footpaths to shared paths, as they may be ‘designing out’ the most vulnerable road users – older walkers and those with a disability.” That issue is crucial at Riverside Park. For a brief piece commenting on the Victoria Walks recommendations from the perspective of bicycling advocates, see “Paths: shared or separated” at Bicycle Network (1Jul2015). This evening (Oct. 11, 2016), the Schenectady County Legislature will almost certainly pass a resolution to authorize acceptance of a grant from the New York Department of State for an ALCO Trail Extension Feasibility Study — extending the Trail from Mohawk Harbor, under the CSX trestle and through Riverside Park. Legislators have touted it as 1.5 miles of uninterrupted bike path connecting Freedom Bridge in Glenville to the Great Western Gateway Bridge (Rt. 5) and Scotia. Some people have said that it would be “nice” to have a bike path through the Park. Others see the connected trail as another way to make Mohawk Harbor more marketable as a place to live, work, shop and play. 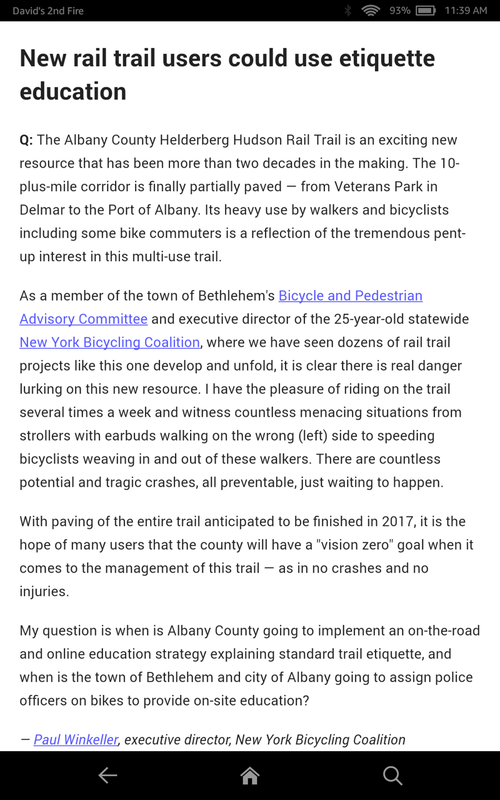 Cycling advocates stress it will complete a shared use path that stretches from Albany to Buffalo NY (as if, a cynic might say, that would be a pinnacle of Western Civilization). 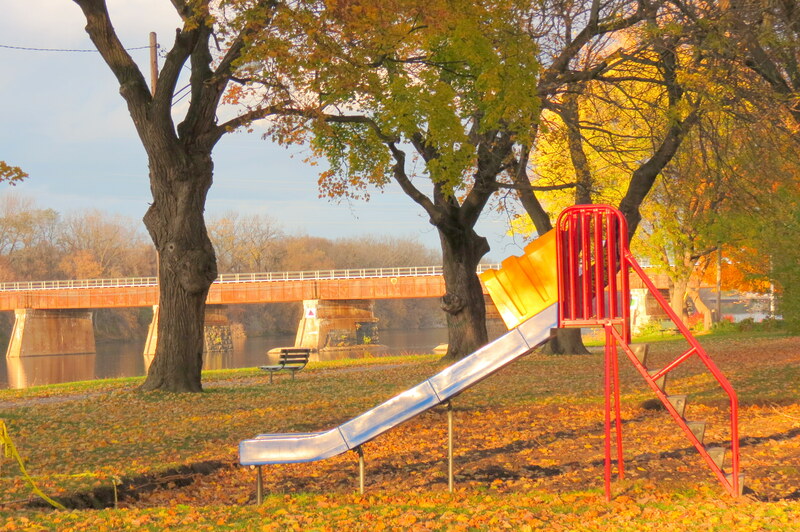 Riverside Park is on the southern border of the residential Stockade Historic District, along the Mohawk River. [click to see the Google Map of the Park] It is only about 6 acres in size, a narrow wedge stretching about 0.3 miles. Indeed, for most of its length it is only 150 to 200 feet wide. The one path through the park is only ten feet wide. . . the path is bordered by large trees and passes only a few yards from the kiddie lot . . The letter to the left appeared in the Times Union Getting There column (Aug. 22, 2016), and is by cycling advocate Paul Winkeller, the Executive Director of the New York Bicycling Coaltion. (Click on the image for larger version.) It states his concerns about the hazards he sees as inevitable on our shared bike-ped trails without significant public safety education and enforcement. Mr. Winkeller wrote about stand-alone bike-ped trails (often constructed along railroad beds or canal tow-ways), but his concerns seem even more cogent and urgent with regard to the proposed bike-ped path through an existing, small, passive park like Riverside Park. PARK SAFETY. The bicycling safety rules for all Schenectady Parks appear to be reasonable and appropriate. They require that bikes only be used on Park driveways-roadways, and at a speed less than 15 mph. Similarly, citywide provisions ban those over ten years old from using a bicycle on a public footpath or sidewalk that is intended for use by pedestrians (see Code sections to right; click on it for a larger version). Ignoring those limitations, and indeed encouraging bicycling in Riverside Park, without at least providing a separate pedestrian path (an alternative suggested in the City Urban Bike Route Master Plan), seems inappropriate and ill-advised. “Feasibility” of the Trail extension must take into account the City’s policy for preserving the safety of its park users. 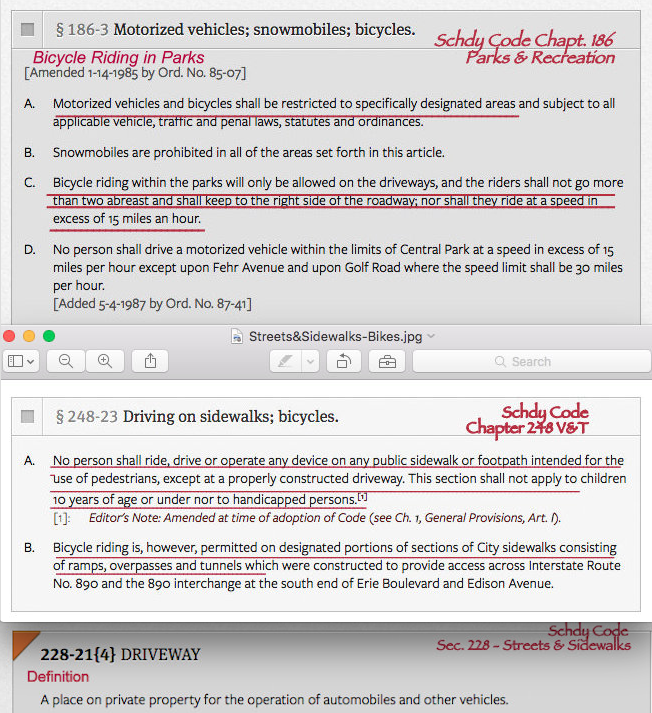 update (June 28, 2017): The draft Bike Schenectady Plan text speaks of “policy” changes to the Schenectady Municipal Code that would, among other things, “open access to park pathways to bicyclists.” (App. D, page D-11; the Appendices are not yet online.) I believe this is an admission that the current Schenectady Code, by its plain language, does not permit bicyclists (unless under 10 or handicapped) on paths such as the one in Riverside Park. It is neither a roadway nor a driveway. The Department’s minimum recommended width for shared-use paths is 4 m.
Four meters is 13.1 feet. Another two-foot graded safety edge is recommended on each side of the path. [Click to see this screenshot from the 2001 Schenectady Urban Bike Master Plan, which shows a cross-section of a Shared Use Path. 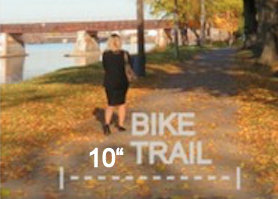 The text, at p. 28, states, “Typical cross sections provide a minimum of 3.0m (10 ft) wide firm surface with 2 foot wide graded shoulders on both sides of the trail.“ Nonetheless, the Figure erroneously labels 10′ as “recommended.”) As stated above, the paved path in Riverside Park is only ten feet wide, with no graded shoulders. And, with trees lining it, and benches, and the limitations imposed by the Overlook/Esplanade and Pump House, it is difficult to envision room for a trail of adequate width, much less for safety signage needed along the trail. The minimum paved width for a two-directional shared use path is 10 ft (3.0 m). . . . In very rare circumstances, a reduced width of 8 ft (2.4 m) may be used . . . . Finally, the disruption of existing uses of recreational space, in addition to the possible safety issues on the mixed-use trail, and for the nearby narrow roads of an historic district, are exactly the sort of negative impacts that would have to be addressed and mitigated, in the required Environmental Impact Statement, if a proposal to extend the Trail is presented to the Legislature. 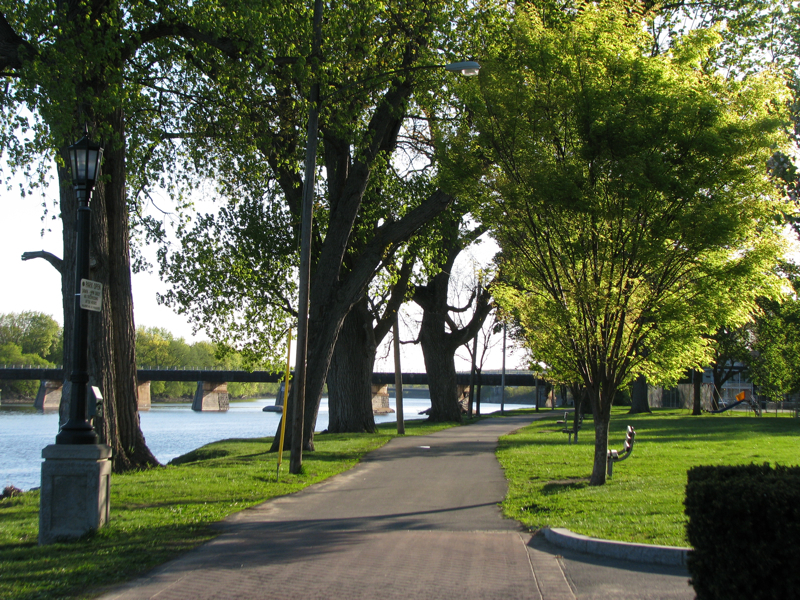 The essence of Riverside Park is its beauty, relative tranquility, and the leisurely pace enjoyed along its pathway and the River, which were praised by the editor of Architect Forum as “probably the finest thing of its kind in America.” (Dec. 1961) Likewise, the Schenectady City Council stated in its 1998 Resolution that “to change its special nature would deprive visitors and disadvantage the homeowners who are the caretakers in this Historic District of national importance.” I hope that the Legislature will ensure that its Feasibility Study takes these important factors fully into account, with ample opportunity for public input as part of the Study process. 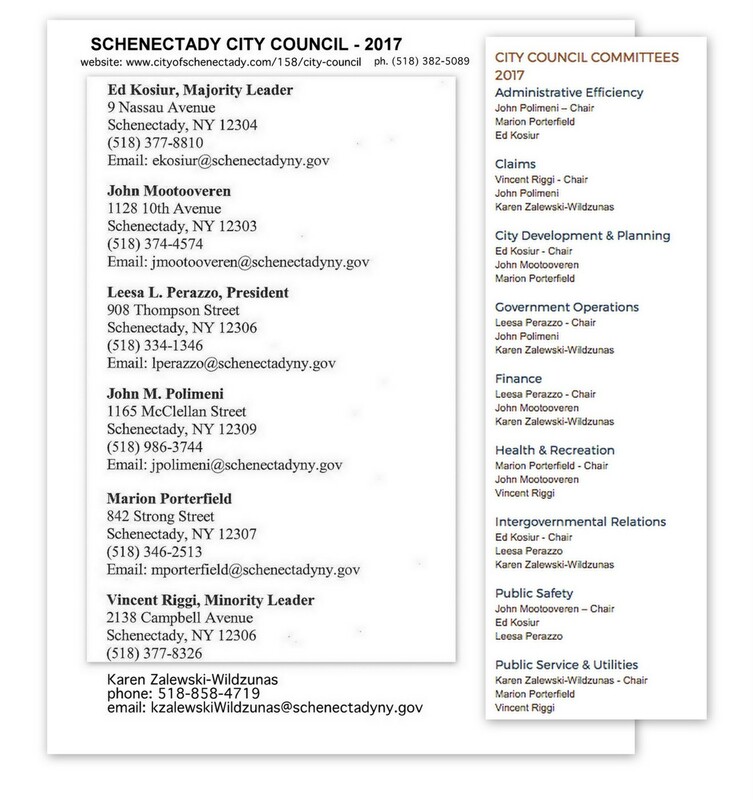 Click on this document link for Contact information on the members of Schenectady’s City Council. Let them know your opinion. And, leave Comments at the Bike Schenectady website. Yes, the bike path makes plenty of sense as if will be a critical dedicated link between the established path at SCCC to the Mohawk Harbor site and onward. 10 feet is the minimum width for shared paths so this is perfectly acceptable in its current state. Perfectly acceptable to whom, John? The minimum is not actually met, since there is no 2-ft. safety edge along the path. And, the minimum is meant for paths that are thorofares, not a path that has been used for decades for conversations, dog and baby walking, observing the River, hopskotch, etc. It will greatly change how most people currently use Riverside Park, and greatly reduce safety and comfort on the path. Whose interests are you looking after?